The Issues: How far do the powers of Congress under the various grants extend? Introduction The United States is a government of enumerated powers. Congress, and the other two branches of the federal government, can only exercise those powers given in the Constitution. The powers of Congress are enumerated in several places in the Constitution. The most important listing of congressional powers appears in Article I, Section 8 (see left) which identifies in seventeen paragraphs many important powers of Congress. In this section, we consider how several of the enumerated powers of Congress under the original Constitution have been interpreted. 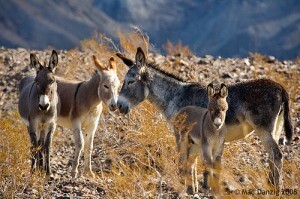 In 1976, a dispute over 19 wild burros rounded up on federal land and sold by New Mexico's Livestock Board reached the Supreme Court (New Mexico vs Kleppe). The Department of Interior argued the New Mexico's action violated the Wild Free-Roaming Horses and Burros Act, while New Mexico countered that the Act exceeded the power granted to Congress by the Property Clause of Article IV, Section 3. New Mexico contended that Congress could regulate only those state actions on federal land that threaten to damage public lands. The Court, however, rejected this narrow interpretation. Congress has the power to enact "needful" regulations "respecting" the public lands and--according to the Court---what is a "needful" regulation is a decision "entrusted primarily to the judgment of Congress." The Court concluded the federal government "has a power over its own property analogous to the police power" of the states. The Court did "not think it appropriate [in Kleppe]...to determine the extent to which the Property Clause empowers Congress to protect animals on private lands." In 2003, the Supreme Court decided Eldred v Ashcroft, which provided the Court its first opportunity to interpret the power of Congress under Article I to extend copyright protection to authors "for limited times." Eldred operated a website that offered for sale works for which copyright protection had expired (or "fallen into the public domain"). He challenged the constitutionality of the Copyright Term Extension Act of 1998--sometimes called the "Mickey Mouse Protection Act" because Disney had lobbied hard for extension of its copyright protection for Mickey Mouse, which was nearing the end of its 75-year term of protection under existing copyright law. Simply put, the argument of Eldred and his many supporters (including librarians and academics who argue that creativity will benefit from allowing use of expired works) was that "limited times" doesn't mean "forever"--and that 75 years of protection is more than enough time to provide an adequate financial incentive for authors. Eldred noted that Congress's first copyright act offered only seventeen years of protection. By a vote of 7 to 2, the Court ruled in Eldred that Congress did not exceed its power under the Copyright Clause. New States may be admitted by the Congress into this Union; but no new State shall be formed or erected within the Jurisdiction of any other State; nor any State be formed by the Junction of two or more States, or Parts of States, without the Consent of the Legislatures of the States concerned as well as of the Congress. 1. Does the Property Clause give the Congress the power to protect wildlife on private land that spends most of its time on federal land (on national park, national wildlife refuge, national forest, or BLM land)? Does the Property Clause empower the Congress to protect a grizzly bear or wolf wanders from federal land onto the private land of a rancher?--or is the rancher free to fire away, state law permitting? 2. Does the Property Clause empower Congress to regulate private activities on private land that adversely effect public lands, such as air pollution from a nearby plant, bright lights from neon advertising, or noise from a racetrack? 3. Does Article IV, Section 3 give Congress the power to regulate any behavior of residents of U. S. Territories that it chooses to, provided no other provision of the Constitution is offended? For example, could the Violence Against Women Act provision invalidated in Morrison be enforceable in U. S. Territories (such as Guam or Puerto Rico), even though it can't be in the fifty states?